A stand out printed 70s Disco Costume, including striking Catsuit. This costume is ideal for 1970s/Dance themed fancy dress occasions! 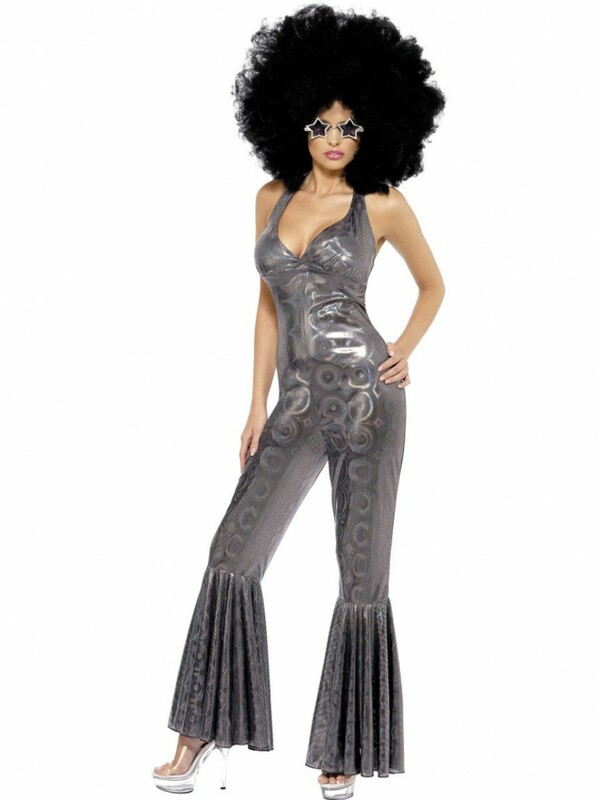 Head to the dancefloor with this stunning 70s Disco Costume, perfect for Disco/Dance fancy dress occasions. The costume includes a dazzling one-piece catsuit. The shiny metallic silver catsuit is styled in an all-in-one halterneck design, which ties at the back. The mesmerizing holographic print turns all attention on you, with a scooped neckline allowing you to show off your assets. The trouser bottoms have a ‘big flare’ finish to them to really emphasise the seventies era. Partner with a pair of funky glasses (sold separately) to fully complete the look! This fabulous costume is perfect for any 1970s/Dance themed fancy dress occasion! 70s Disco Diva Costume including Silver Flared Jumpsuit.